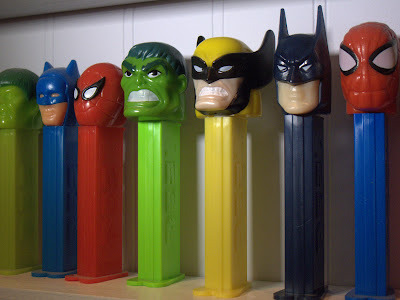 Super Hero PEZ dispensers stand watch over me. The new X-Men Origins Wolverine movie inspired today's photo. The Super Heroes are front and center in my collection of PEZ dispensers. Only other PEZHeads can truly appreciate. Canon G10, 1/125 sec at f/3.5, ISO 400 in macro focus mode.